For this year's Nobels, Princess Sofia put yet another new twist on an old favorite. 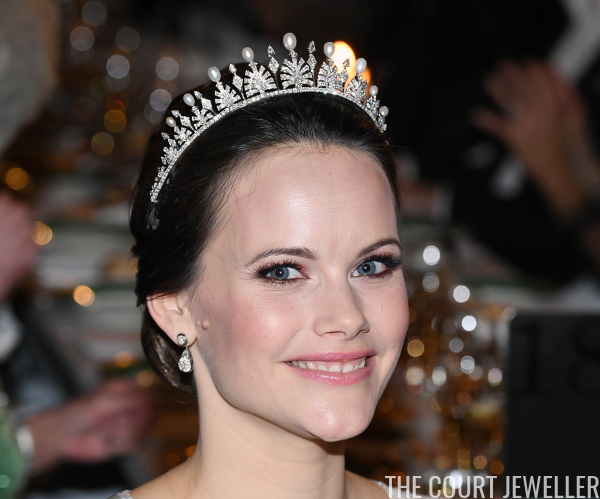 Here's a look at the jewels she wore for the prize ceremony and banquet in Stockholm. Sofia debuted a third setting of her wedding tiara at Sunday's festivities. This one features pearls in place of the emeralds that originally sat atop the diamond palmette elements. Here's more info on the tiara's original creation and setting. 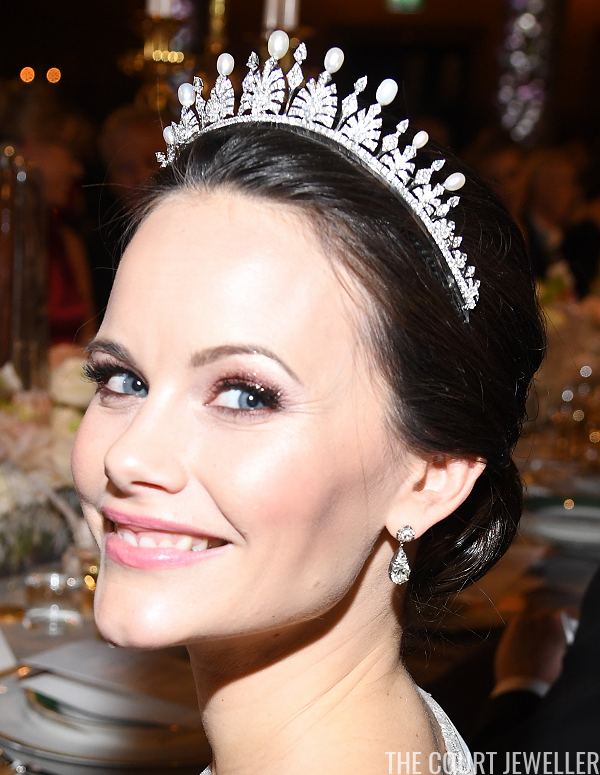 Sofia recently wore the tiara in an all-diamond format, without any toppers on the palmettes. At that occasion, it was evident that the shape of the tiara had been altered, so that it forms more of a halo shape around Sofia's head. That change was even more evident at the Nobels this weekend, when she paired the tiara with her wedding earrings. Those earrings come from the stomacher owned by Queen Josefina, and they're also worn by other Bernadotte ladies (primarily Crown Princess Victoria). 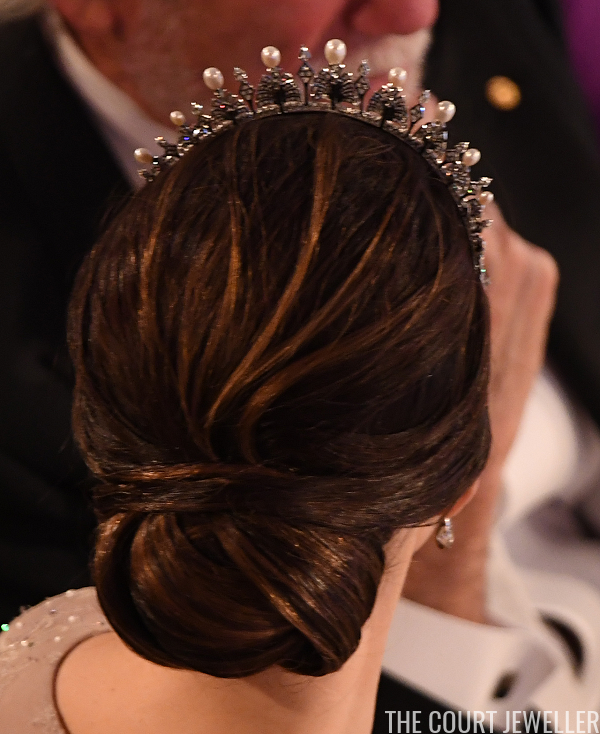 The event even gave us a look at the back of the tiara, which is always a wonderful viewpoint. 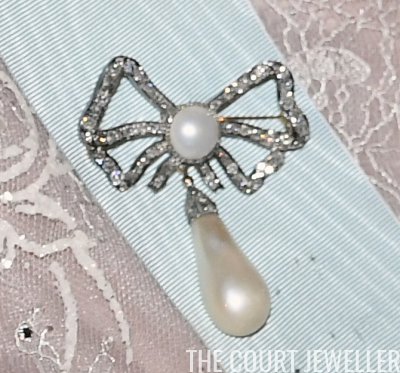 Sofia secured the sash of the Order of the Seraphim with the family's diamond and pearl bow brooch, which features a pearl drop. Here's a look at Sofia's entire ensemble, which gave off a modern fairytale vibe.